Flat screen TV’s contain a flat screen display panel together with a number of circuit boards mounted behind it against the rear of the display panel. One of those boards is the power supply which delivers appropriate power to the other circuit boards and internal components. Since modern TV’s are ‘instant on’, the power supply is always operating in a standby state waiting for the user’s remote control to tell it to turn on the TV. If you compare the amount of time the TV is powered up in standby mode, to the length of time the TV is actually being used to provide a picture, you begin to realize that the power supply will age much faster than all of the other components. The capacitors on the power supply board age out the fastest, due to their construction and purpose combined with this ‘always on’ mode. I discovered that a used power supply board to fit our TV model was available for under $50US. I also learned that there were sellers making replacement capacitor kits to fit each particular power supply board. The location of the capacitors is shown on the photo of the circuit board using yellow arrows. I needed to provide the TV model number and circuit board model and serial number and they would supply an appropriate kit. When you know that I partially funded my college education repairing old tube type TV’s and installing electronic components in homes and vehicles, you’ll understand that installing a few capacitors on a circuit board does not present much of a challenge to me. However, as it turned out, the supplier did not have a kit for my TV, so I elected to purchase the used board. I knew that it was a stop gap measure. I also knew that trying to find the appropriate replacement parts while travelling would be difficult. Compounding the issue was the fact that the TV was mounted on a purpose built, welded aluminum mounting frame (see Photo) mounted to the coach front structural members, then hidden behind wood matching the interior of the RV. It required two strong people to hold the TV and mounting frame while someone else removed the attaching screws. This frame had been frequently removed and reinstalled during RV service work over the years and the mounting screws had been relocated to fresh locations such that the mounting superstructure looked like a pin cushion from all the no longer used holes in it. I would not be able to remove and re-install the TV very many more times without coming up with a solution about where to attach the frame to the coach structure. When the used board arrived, I installed it and tested the TV and it returned to normal operation – for a few months. I provided the information about the values of the capacitors on my original board and the supplier sent me suitable replacement capacitors which I installed. I had a backup board ready for the inevitable failure of the used power supply board. Three months later, turning on the TV resulted in the same ‘pop’ and no TV situation. I installed the replacement (original) repaired power supply board and the TV resumed operation. Within a few weeks, another ‘pop’ event occurred. This time I removed the TV and took it to a nearby repair shop for further diagnosis. I could see that a resistor had burned however I had no idea what the resistance value was since it was blackened. Resistors have colored rings on them that signify their resistance value and replacements simply need to have the same value as the originals (same color rings). The shop called a day later and said it was repaired and ready to pick up. The technician found a similar resistor (one that is very difficult to find, I learned) on a used board from another TV that he had scrapped. 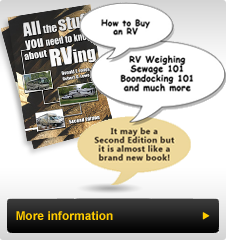 We had an interesting discussion while there and I’ve had a similar discussion with other RV owners subsequently. The repair shop personnel said power supply failures are very common (likely because of the instant on usage) and their experience is that TV’s in RVs fail sooner than ones in homes. Speculating on the reasons for this lead us to speculate that the variety and quality of power sources at each campground visited, the use of inverters to keep the TV ‘alive’ while travelling and the constant vibration that TV’s in RV’s sustain as the vehicle is driven down the road contribute to the early failures. The common thread is that the flat screen TV’s seem to fail sooner than one would expect given the hours of use they get. As you can imagine when the next failure occurred, it was time to replace the TV. That seemed like a simple process until I began shopping for a TV. The original TV was a 32” (81cm), which is the measurement of the screen on a diagonal from corner to corner. It had about a 2” (5cm) wide band of plastic surface all around the screen which was somewhat wider on the sides to allow for the speaker grilles (see photo). I discovered that a new 40” (102cm) TV was about the same physical size however mounting it on our TV support frame would not be possible. I decided to stay with the Samsung brand since we have two TV’s controlled with a single remote in that area and I thought it would be a significant challenge to control two TV’s, the home theatre sound system and the satellite TV receiver, when adding another remote control, to control another brand of TV. (Subsequently I learned about a Logitech ‘My Harmony’ remote control which allows one remote to control any TV brand and all of these components with a single remote). After some thought, I decided to eliminate the original TV mounting frame and use a standard swing out TV wall-mount attached to the RV superstructure on the side of the opening. With some simple adaptations it works very well. Setting the height was critical however the new TV weighs considerable less than the original and without the frame, it was easy for one person to hold the TV in position while another located the installation height. The TV bracket is mounted using the TV’s industry standard rear mount. The TV ‘hangs’ on a moveable portion of the mount allowing one to center it. The challenge is that the mounting position is angled to allow the TV to face on a downward angle to be easier to watch from where we sit. The mount can be tightened to support the TV on that angle however I thought it would "fall forward” away from the cabinetry over time while driving. The solution was to use two 3/8” (1cm) diameter bungy cords with a sliding hook on each connected to the coach structure in behind the mounting area and the ends mounted to the TV mount. Doing this on either side provides the tension to maintain the TV in position all the time. The other challenge was that the TV was not perfectly square in the opening and no amount of adjusting could square it up. The simple solution was to go to a fabric store and purchase some 1” (2.5cm) wide waistband elastic and some dome fasteners. The elastic was mounted with a screw through the material to the bottom of the TV about 3” (8cm) in from each side. A dome mount was installed on the wood frame surrounding the TV. The mating dome button was installed on the elastic which is about 3” (7.5cm) long. The elastic has some "give” to allow the TV to flex slightly, while still retaining it in the proper position. Snap off the domes, pull the TV forward enough to reach in a release the two bungy cords and the TV swings out to reveal a cavernous area with easy access to everything on the TV connection area. In addition, any servicing of the components installed in this area is now a "snap” (pun intended!). We installed a small amount of Velcro nearby where the TV back touched the wood frame. This stabilizes the TV frame and eliminates those annoying "plastic TV body to wood squeaking” sounds. After over 3,000 miles (5,000 km) the installation has proven very secure and squeak free. The beauty of this TV swap was that the picture size and clarity increased considerably (we now have two 40” screens) which given the distance from the front screen to the viewing area makes it much easier to see. Should the center TV (mounted in the middle of the RV) decide to quit, we can install a 48” TV in place of the existing 40” to regain the size differential. The Logitech "My Harmony” remote which we subsequently added, utilizes a connection of the remote to an internet connected computer to program. You enter on Logitech’s My Harmony website the model and serial numbers of each of the components you want the remote to control, connect the remote with the supplied USB cord and then it will program the remote to work. Remove the USB cord and try it. Testing it may require some "teaching” using the existing component remote. The My Harmony Remote has an interactive screen to allow you to read and answer questions by depressing buttons to deal with issues easily. We occasionally need to use the original TV remote when using the OTA (over the air) antenna to select the station scan menu, or when one TV gets out of sync when changing modes. Learning to properly aim the remote usually keeps this issue to a minimum. With this remote you are not constrained to each TV being the same brand and adding another component is as simple as editing the My Harmony remote control programming. We have been very pleased with the change in TV and the new remote control. Hopefully this TechTip will provide some guidance in making the transition as TV’s in your coach fail.